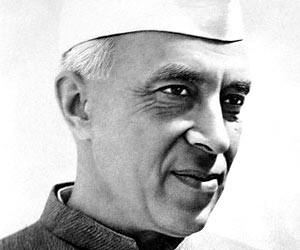 Jawaharlal Nehru was the first Prime Minister of Free India. He was one of the most prominent figures in Indian politics both pre and post-Independence era. Not only did Jawaharlal Nehru become an important figure in the freedom movement of India, he also ended up ruling India after her independence until his death. In this article on first Prime Minister of Free India, we will take a look at Jawaharlal Nehru’s life, his political career and a bit into his personal life. We need to say that the scope of this article will limit us from going into details and hence, we will satisfy ourselves with the tip of the iceberg instead of diving down to its very bottom. Let us take a quick glance at Jawaharlal Nehru’s life and political career in a tabular format. Previous Prime Minister None. Position was created. Popularly known as Pandit Nehru and famous among children as Chacha Nehru, Jawaharlal Nehru is considered as the architect of modern India. Born in Allahabad, he hailed from a wealthy family. His father Motilal Nehru, who was a well-known barrister. Even his father, Motilal Nehru, was associated with Indian politics and had served as President of Indian National Congress twice. Jawaharlal Nehru received his primary education at home. His father hired tutors who taught Nehru at his residence. However, when Jawaharlal Nehru turned 15, he was sent off to England. There he spent 2 years at a place named Harrow. After that, he joined the Cambridge University. There he studied Natural Sciences and received Tripos. Once he graduated, he decided to stay there for another two years and studied law from Inner Temple or Inns of Court School of Law. He completed his law studies in 1912 and the same year in August, he returned to India. Once he came back to India, he became Allahabad High Court advocate. He did try to settle down as barrister but unfortunately, he wasn’t really interested in law. Over the course of time, he started losing interest in law and got involved more and more in politics. When he was a student, Ireland’s Sinn Fein Movement grabbed his attention. It was logical that in India, India’s struggle for her Independence was something he got attracted to. His first association with Indian politics took place in 1912. He went as a delegate to Bankipore Congress. Then in 1919 he was appointed as secretary of Allahabad’s Home Rule League. Prior to his association with Home Rule League, he met Mahatma Gandhi in 1916. This meeting left a deep mark in Nehru as he was deeply inspired by Gandhi. In 1920, he arranged Kisan March in UP and then became associated with Non-Cooperation Movement. Because of his association with Non-Cooperation Movement he was jailed twice between 1920 and 1922. 1926 Visited Russia, Germany, Belgium, England, Switzerland and Italy. In Belgium in particular, he was INC’s official delegate to Brussels where he attended Congress of Oppressed Nationalities. 1926 In Madras, India, Nehru made Congress committed to Independence goal. 1927 Went to Moscow and attended celebrations of October Socialist Revolution’s 10th anniversary. 1928 In Lucknow, he was hit by lathi because he led a procession. It was a protest against Simon Commission. 1928 Nehru was a signatory of Indian Constitutional Reform’s Nehru Report (the report was named after Motilal Nehru) at All-Party Congress. 1928 Founded a body known as Independence of India League. He was appointed as General Secretary of the body. 1929 Became President of INC’s Lahore Session. 1930 – 1935 Went to jail because he was associated with several Congress-led movements including Salt Satyagrah. 1935 Finished writing Almora Jail on February 14. It was his Autobiography. 1940 Nehru was arrested again because he was offering Satyagraha (individual) against forcing India to participate in War. 1942 In Bombay’s All India Congress Committee session, he moved the resolution of ‘Quit India’ on August 7. 1942 He was arrested once again on August 8 and was released in January 1945. 1946 He became Congress’ President. This was his 4th tenure at that position. 1947 On August 15, he became Independent India’s first Prime Minister. Nehru was married to Kamala Kaul in year 1916. Together they had a daughter whose name was Indira. Indira was born in 1917. In 1924, the couple had a son but the son lived only for 7 days. When Indira grew up, she was married to Feroze Gandhi and hence, she became known as Indira Gandhi. Feroze and Indira Gandhi together had two sons – Rajib Gandhi and Sanjay Gandhi. It is being said that Nehru had relationships with various other women too. Those women were Edwina Mountbatten, Padmaja Naidu and Shraddha Mata. Pamela Mountbatten, the daughter of Edwina Mountbatten, confirmed the platonic relations between Edwina and Nehru. Nehru laid the foundations of modern India. He gave India a very robust foreign policy. He was the one who created the system of universal primary education. Nehru dreamed of a unified India and he warned Indians stating, “Integrate or Perish”. However, 1962’s Sino-Indian war in which China defeated India, left a scar in Nehru’s legacy. Some historians think that if Nehru retired in 1958, India would have definitely remembered him as THE BEST Prime Minister till date.